The sun was shining over the Circuit de Catalunya as qualifying for the Spanish Grand Prix got underway. Giedo van der Garde managed to finish top of the backmarker teams, just ahead of Jules Bianchi. The surprise in Q1 came from both Williams drivers dropping out of the session, particularly as Pastor Maldonado won this race from P1 last year. Both Toro Rosso drivers made it through to Q2, and managed to finish 11th and 12th with Daniel Ricciardo ahead. Jenson Button was still struggling in his McLaren and dropped out in the second session, despite teammate Sergio Pérez getting through to the top ten. The final shootout saw Kimi Räikkönen set the first benchmark, until Nico Rosberg pushed him down. Sebastian Vettel left it for a one-lap shot but couldn’t get higher than third place, Mark Webber was eighth. 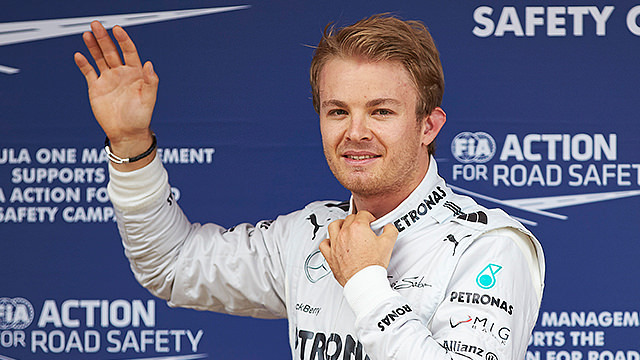 Rosberg improved on his own time to secure pole position, followed by teammate Lewis Hamilton, just two tenths down. Home favourite Fernando Alonso was fifth with his Ferrari teammate just behind him. Notably, all ten drivers set a lap time, with Pérez finishing ninth ahead of Paul di Resta in tenth.